Fig. 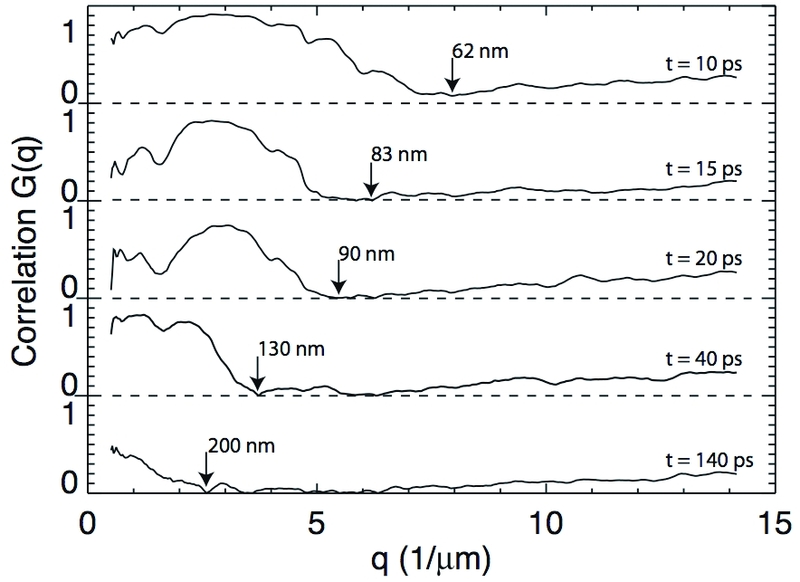 1: Coherent diffraction patterns recorded for delays of -5, 10, 15, and 40 ps after the optical laser ablation pulse. Degradation of the nanofabricated sample appears as a loss of high spatial frequency information. Additional structure that causes speckles at around 100 nm spatial period, and a periodic structre, grows with time. Phase retrieval reconstructions of the undamaged sample (left) and at a 15-ps delay (right) are also shown, with a 2-micron scale bar. Fig. 2: Cross-correlation functions of the time-dependent diffraction intensities with the diffraction of the unablated sample. Arrows point to the largest feature size at which the correlation function approaches zero, indicating the length scale of destruction in the sample. Anton Barty1,7, Sebastien Boutet2,3, Michael J. Bogan1, Stefan P. Hau-Riege1, Stefano Marchesini1, Klaus Sokolowski-Tinten4, Nikola Stojanovic4, Ra’anan Tobey5, Henri Ehrke5, Andrea Cavalleri5 ,9, Stefan Düsterer6, Matthias Frank1, Saša Bajt1, 8, Bruce W. Woods1, M. Marvin Seibert3, Janos Hajdu3, Rolf Treusch6, and Henry N. Chapman1, 7, 8. 1Lawrence Livermore National Laboratory, 7000 East Avenua, Livermore, California 94550, USA. 2SSRL, Stanford Linear Accelerator Center, 2575 Sand Hill Road, Menlo Park, California 94025, USA. 3Laboratory of Molecular Biophysics, Department of Cell and Molecular Biology, Uppsala University, Husargatan 3, Box 596, SE-75124 Uppsala, Sweden. 4Institut für Experimentelle Physik, Universität Duisburg-Essen, Lotharstraße 1, 47048 Duisburg, Germany. 5Department of Physics, Clarendon Laboratory, University of Oxford, Parks Road, Oxford OX1 3PU, UK. 6DESY, Notkestraße 85, D-22607 Hamburg, Germany. 7Center for Biophotonics Science and Technology, University of California, Davis, 2700 Stockton Boulevard, Ste 1400, Sacramento, California 95817, USA. 8CFEL, Universität Hamburg at DESY, Notkestraße 85, 22607 Hamburg, Germany. 9Max Planck Research Group for Structural Dynamics, CFEL, Universität Hamburg at DESY, Notkestraße 85, 22607 Hamburg. Germany. Published as: “Ultrafast single-shot diffraction imaging of nanoscale dynamics”, Nature Photonics 2, 415–419, (2008). Combining an optical laser with FEL pulses from FLASH in a pump-probe set-up enables imaging with high temporal and spectral resolution. A nanostructure is ablated by an optical laser and this process is followed with lensless coherent diffractive imaging using FLASH pulses. A spatial resolution of better than 50 nm is achieved. By taking pictures of a succession of exploding targets, a movie can be made following the dynamics of the solid material on a 10-ps timescale. 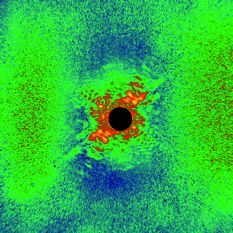 With short-wavelength X-ray FEL sources this method will enable higher spatial resolution imaging and could be used to measure the dynamics of highly correlated systems at nanometer length scales. The FLASH FEL provides soft X-ray pulses with pulse durations down to a few tens of femtoseconds. This pulse duration provides the shutter speed to produce a movie of a nanostructure that is ablated by an optical laser. The ablating optical laser pulses are synchronized to FLASH and the relative delay was incremented with 10 ps steps with an optical delay line to observe the time evolution. We achieved a spatial resolution better than 50 nm, using 13.5-nm wavelength FLASH pulses, and the lensless imaging technique of coherent diffractive imaging1. This ultrafast high-resolution imaging opens up the study of condensed phase dynamics, such as crack formation, phase separation and nucleation, and rapid fluctuations in liquids or biologically relevant environments2. To demonstrate ultrafast single-shot imaging we fabricated many identical nanostructured samples in a 20-nm thick silicon nitride membrane coated with a 100-nm thick iridium film, using a focused-ion beam (FIB) to mill out a 2.5-µm wide structure similar to the logo of a Canadian Hockey team of renown (to some of the authors). A 130-nm diameter pinhole was also milled into the membrane, 6 µm from the structure. The entire fabricated structure served as a reference in which to observe dynamics on a wide range of length scales. The ablation process was initiated with the FLASH facility’s 12.5-ps duration Nd:YLF laser operating at 532 nm wavelength and focused onto the sample with a peak intensity of about 2.2 x 1011 W cm-2. The movie was recorded with FEL pulses of 20 µJ mean energy that were focused onto the sample. Since each FEL pulse completely destroyed the object, we recorded each frame with a separate identical structure. As previously seen from studies of spherical test objects at FLASH3 the FEL pulse duration is shorter than the radiation damage processes caused by the rapid photoionization and heating that occurs upon irradiation. Thus the destruction initiated by the FEL probe pulse does not influence the laser-induced dynamics under observation. Frames of the ultrafast movie are shown in Fig. 1. These are coherent diffraction patterns acquired for different delay times after the laser pulse. The disintegration of the structured sample is evident as a loss of information at high scattering angles. At the same time additional structure is induced in the foil by the ablation pulse, which shows up as fine speckles at scattering angles corresponding to structures smaller than 100 nm. Additionally a pair of strong diffraction peaks is observed after about 140 ps, due to a light-induced periodic structure in the foil4. We can quantify the changes in the structure by correlating the time-dependent patterns with the undamaged pattern. We use a correlation analysis similar to that used in X-ray photon correlation spectroscopy5. These correlation functions, averaged over shells of constant momentum transfer q, are shown in Fig. 2. A unity value of the normalized correlation function corresponds to an unchanged structure. We see the drop in correlation occurs at smaller q values (longer length scales) as time progresses, propagating at 5000—6000 ms-1 during the first 20 ps, consistent with the sound speed in the heated membrane. The explosion slows to 1000—2000 ms-1 by 140 ps as the resultant plasma expands and cools. We have also reconstructed images of the ablating structures, by iterative phase retrieval (see Fig. 1). At short time delays the 130-nm reference dot provides a reference wave that aids reconstruction. However, by 10 ps this dot is half its initial size and is no longer visible after 15 ps. The method of ultrafast diffractive imaging will be further developed to achieve higher spatial resolution at future short-wavelength X-ray FELs. In particular we aim to measure the dynamics of highly correlated systems at nanometer length scales. Such methods are only possible with the unique characteristics of FEL sources: high peak brightness, short wavelength, and full coherence. H.N. Chapman et al. “Femtosecond diffractive imaging with a soft-X-ray free-electron laser”, Nature Physics 2, 839 – 843 (2006). K. Sokolowski-Tinten, J. Bialkowski, A. Cavalleri, D. von der Linde, A. Oparin, J. Meyer-ter Vehn, and S. I. Anisimov, “Transient states of matter during short pulse laser ablation”, Phys. Rev. Lett. 81, 224–227 (1998). H.N. Chapman et al., “Femtosecond time-delay x-ray holography”, Nature 448, 676–679 (2007). 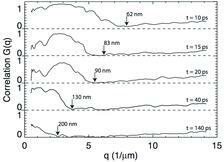 J. F. Young, J. S. Preston, H.M. van Driel, and J. E. Sipe, “Laser-induced periodic surface structure. II. Experiments on Ge, Si, Al, and brass”, Phys. Rev. B 27, 1155–1172 (1983). G. Grübel, G. B. Stephenson, C. Gutt, H. Sinn, and T. Tschentscher, “XPCS at the European X-ray free electron laser facility”, Nucl. Instrum. Meth. B 267, 357–367 (2007).